While Halloween can be fun for children with candy and costumes, it can be a frightening time for pets. Keep pets in a secure and quiet place in your home while trick or treaters are knocking at the door. 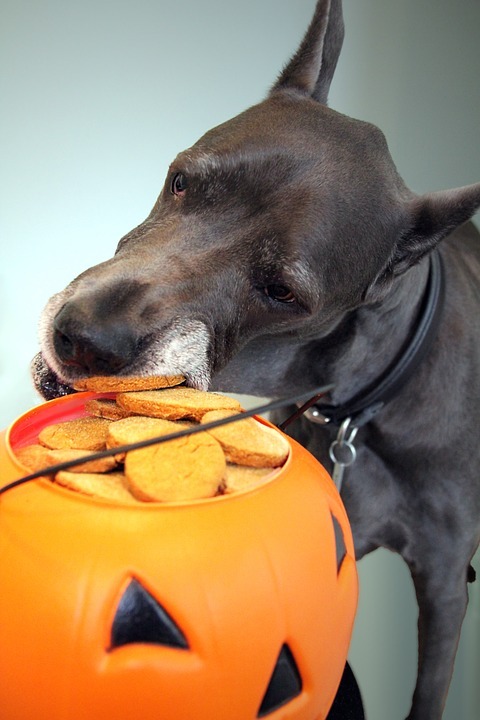 If you want your pet to greet trick-or-treaters, have a helper than can hold the leashed dog inside the home. As for kitties, animal organizations advise to keep cats indoors at all times. It is not uncommon for cats to be captured and tortured near and on Halloween. 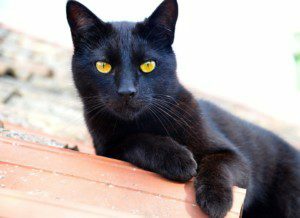 All cats, especially outdoor and black cats, should be brought indoors where they will be safe. Candy and pets do not mix, particularly chocolate and “sugar-free” pets. Ensure that all candy wrappers are thrown away and that pets cannot get into the trash. Teach your children not to share their candy with pets. Burning candles inside pumpkins can be knocked over, creating a fire hazard. Be aware that even if placed on an upper shelf, the family cat can jump! Fido’s wagging tail can cause the pumpkin to tip over. If you choose to dress your pet in a costume for Halloween, remember that the costume should not be restrictive of movement or constrictive of circulation. 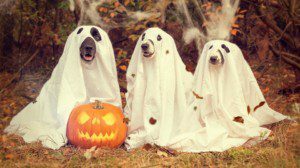 Make sure your pet’s costume has holes large enough for them to see out of. While some pets are used to wearing outfits, there are some that are not, resulting in undue stress for your pet. You and your children will enjoy your Halloween much more if Fido and Fluffy enjoy theirs!